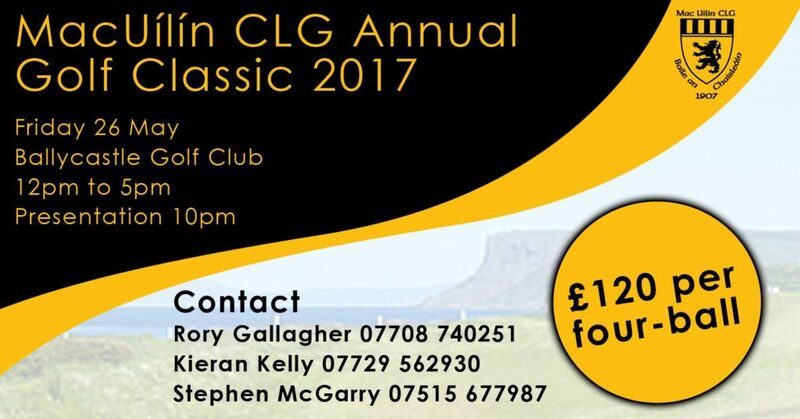 The MacUílín CLG Baile an Chaisleáin Annual Golf Classic 2017 will take place on Friday 26 May at Ballycastle Golf Club. The following have kindly offered to sponsor the event on the day. MacUílín CLG Baile an Chaisleáin is grateful for the businesses who choose to support the club through sponsorship. If you are interested in sponsoring a team or pitch side banner contact the Secretary via email. Click here to read the results of the MacUílín CLG Annual Golf Classic 2017.